For me, my primary deck is Turbo Depths. It used to be Rock/Junk before DRS was banned, but c'est la vie. However, I am also actively trying to have several other decks available in case of a big metagame shift or if I get bored. It gets expensive that way, but I am also patient and watch prices, trade in cards I don't use to the LGS for credit so I can purchase other cards. However long it takes I am actively trying to have staples available to play the types of decks I enjoy. TL,DR - Do you play only one deck in Legacy or do you have 2+ options to keep from getting stale or bored? I usually only own 1 or 2 decks at a time. Right now Painter and Steel Stompy because they have a fair amount of overlap. But I've piloted many different decks at larger events from borrowing cards or just trading in and out of decks. I have Miracles, Storm, Elves, and Dredge around, and I just got some wastelands so I could probably build Delver without too much effort. I play with my wife and lend decks out to friends, so once a deck gets built it usually stays built in some form. My "trade" binder ends up being all the sideboard options and deck variant cards. I could turn Reanimator into some sort of UBx Delver list; Miracles has been reincarnated many times ad Landstill, Quinn & Parfait; ANT was TES once; Deadguy came from a Pox list; Food Chain could just as easily be BUG Delver. Burn is just Burn I guess. I mean I could recombobulate all the cards and make a UR Delver list, but it would leave behind a number of 75% completed decks, which does me no good if someone tags along to a tournament and needs a deck. So if I ever made that move, it would be by getting another set of Force of Wills and Volcanic Islands. But in this economy, seems unlikely. My ceiling has been reached. The only deck there I can't build would be Burn, because I never bothered to buy Eidolons. Oh and I am missing one Thalia's Leuitenent to build Humans correctly. I don't know what RUG Faeries is, but I likely have the cards to build it. I think I am missing a couple sideboard cards for optimal Dragon Stompy too. Cool, it seems like a lot of people have the option to play legacy essentially how they want to. I think this is one of the bigger issues facing the format. It changes so slowly over time so your deck is valid almost indefinitely (in some form) but the issue becomes how to stay engaged without getting bored. One thing I noticed for a while is that many of the locals would have a tier deck built but have Turbo Depths or Death and Taxes in their back pocket. I also noticed that a lot of players let others borrow decks to get a different experience at the weeklies. This takes a tight community, which we have, which is pretty awesome. People that would never purchase a Tabernacle get the experience of piloting Lands if they want. Non-blue players get to sling Force of Wills and Volcanic Islands. The Miracles guy that is bored borrows Turbo Depths or Br Reanimator. I didn't know if this was widespread or if people are just lone rangers dedicated to their one deck. Cool, it seems like a lot of people have the option to play legacy essentially how they want to. I think this is one of the bigger issues facing the format. It changes so slowly over time so your deck is valid almost indefinitely (in some form) but the issue becomes how to stay engaged without getting bored. I spend most of my magic time in standard and EDH since that's what my friends mostly play. I'm on one deck. No plans to- or interest in- building another. If I get bored, I take a break (from Legacy, not Magic). And some even more jank like things like Bant Edric Fish, Shardless Bant, Stasis, and several more various stompy flavors. 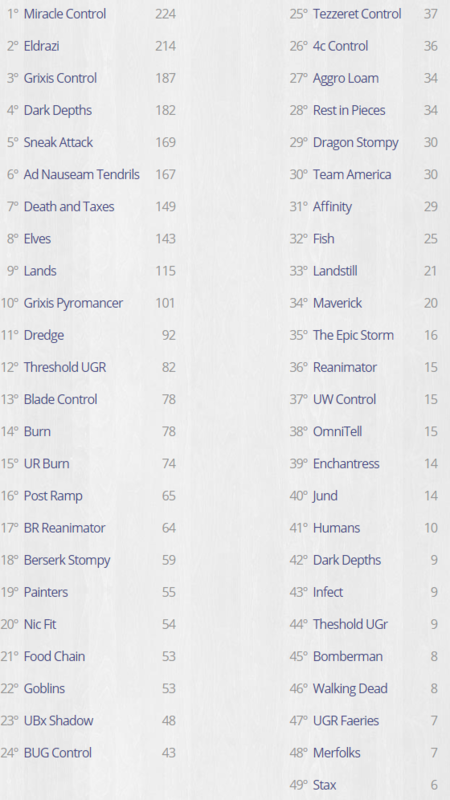 I was just curious about what everyone's approach to legacy in regards to deck diversity. i will make any deck for myself that doesn't have brainstorm in it. i will however make any deck for someone that wants into the legacy event but doesn't have a deck. i have about or so 17 decks right now in various states of completion. I have cards for dozens of different decks. I try to disassemble my decks as soon as I get home so I can build whatever for the next time around. That said, I usually have one deck I'm playing for a few months and I'll play a random less-good deck occasionally. ...I've just realized that I've not sleeved any Brainstorm since January 2017. As for many of us adult players the money constraint is not so severe but the time constraint is - and we become more collectors and theorycrafters. I got all the cards for the blue decks, delver, blade, miracle, SnT, storm, shardless, food chain. I also have cards for rock/nicfit and am working towards lands. I currently got TES, uwr miracle and Slow depths put together and sometimes lend a deck to a younger player on legacy nights at the game store. Most restrictive cards that i dont own is cradles, ports (i only play OG art) and cities. I recently accuired tabernacle by getting out of old school so next protect i lands. I’m also a playset fow away from having two blue fair decks at the same time. I’m teaching my 7yo son to play so there’s a meaning with that beyond just collecting. I can build literally everything, unfortunatelly I get to play legacy one every onth or even two months. In past I used to gravitate towards few decks I really liked, nowadays I try to bring a different deck every time.. still far from completing the full circle of all decks rotation. i probably would sleeve up ANT or TES, but my local has at least 1-2 ANT players every week. I used to play doomsday exclusively for several years, but I'm not such a fan in its current offering. i also still have all the cards for burn. i like nicfit too and did have some fun playing a 75 card maindeck reanimator before DRS was banned, but i don't have enough time to play. i guess i average about 1-2 times per month, although in 2018 i probably played around 5 times. I have cards for dozens of different decks. I try to disassemble my decks as soon as I get home so I can build whatever for the next time around. Pretty much this. If I enjoy playing something I'll play it for 2 or 3 events, most of the time I just build something new each week. The exception would be GP prep, where I'll pick a deck and jam it for a couple months before the event. I used to be on one deck only with a second one starting to build. Then they banned SDT and GP.